We ask the big questions: How long does it take for a city’s investment in renewable energy to pay off? Is it less expensive to eat locally-produced food? How does the NBA determine ticket prices? From social issues to the business world, economics touches almost all aspects of our lives, and these are just a few real-world topics our students have researched. 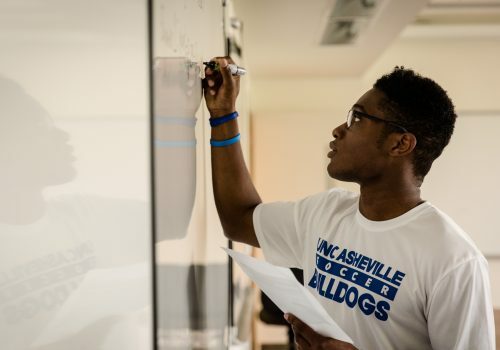 As North Carolina’s public liberal arts university, UNC Asheville offers unique opportunities to economics majors, including small, collaborative classes, faculty mentorship, and the chance to apply economics to contemporary concerns, like the environment, human diversity, and globalization. Within the general major in economics, students can focus on their interests in areas such as environmental economics, international economics, monetary economics and finance, and beyond. All economics majors undertake a research project, and many graduates use this research as a stepping stone to graduate school or a career in a variety of fields, including finance, small business, education, the nonprofit sector, government, and more.